Baldwin has a 60 year legacy of craftsmanship and innovation. Rated #1 in quality by builders and contractors, Baldwin is pleased to offer a line of luxury hardware for the discriminating consumer, our Prestige Series. Feel the difference - Baldwin hardware is solid throughout. With a 60 year legacy of superior style and quality, Baldwin is the choice for an elegant and secure presence The Polished Brass finish adds to the traditional look and feel of the product and makes a classic statement. This single cylinder deadbolt can be locked or unlocked by a key on the outside, or the turn button on the inside. 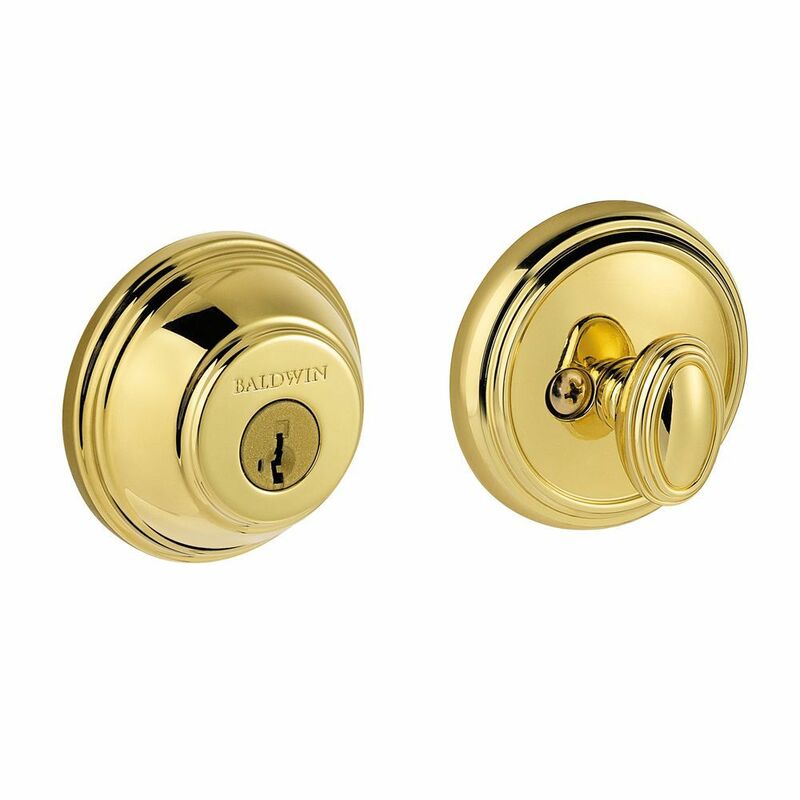 Prestige Polished Brass Single Cylinder Round Deadbolt Baldwin has a 60 year legacy of craftsmanship and innovation. Rated #1 in quality by builders and contractors, Baldwin is pleased to offer a line of luxury hardware for the discriminating consumer, our Prestige Series. Feel the difference - Baldwin hardware is solid throughout. With a 60 year legacy of superior style and quality, Baldwin is the choice for an elegant and secure presence The Polished Brass finish adds to the traditional look and feel of the product and makes a classic statement. This single cylinder deadbolt can be locked or unlocked by a key on the outside, or the turn button on the inside. Prestige Polished Brass Single Cylinder Round Deadbolt is rated 4.9 out of 5 by 11. Rated 5 out of 5 by Outofhere from Action is smooth. Action is smooth. Rated 5 out of 5 by DoggieDaddy from Trickier install than the average deadbolt, however this is no... Trickier install than the average deadbolt, however this is no run of the mill deadbolt either. Great quality product with a finish that will certainly stand up over time. I appreciate how the quality of the internal components is evident as well as the external finish, especially knowing the intended use of a deadbolt. Definitely worth the extra expense when comparing the longevity of this deadbolt versus others on the market, and the SmartKey feature only adds to the value found in the Baldwin product lines. Buy with confidence. Rated 5 out of 5 by RMP from Easy installation.Looks great. Lifetime warranty.... Easy installation.Looks great. Lifetime warranty. Rated 4 out of 5 by HomeDepotCustomer from All other locks are older Baldwin and it would have... All other locks are older Baldwin and it would have been nice if the key style would have been the same. Rated 5 out of 5 by Onlooker from Easy to install, nice looking finish, and solid quality feel.... Easy to install, nice looking finish, and solid quality feel. Beware if you have both left and right opening doors (side of door hinges), that the lock cylinder can be easily reversed by removing the cylinder clip flipping the cylinder and reinserting the clip. Very easy to do.